Which is better: letting pain and muscle spasm immobilize an injured spine or doing it with the same tools we’ve used for decades? Should hypothermia begin DURING the arrest? Do response times make any difference whatsoever in patient outcomes? The answers to these and other hot EMS topics were intensely debated in Dallas last week at the 14th annual Gathering of Eagles, EMS State of the Science Conference. It is in great sadness that we as a Brotherhood post the 13th Line Of Duty Death in 2012 from the United States Fire Administration. Fellow Brother Firefighter/Fire Marshall Matt Waller has made the ultimate sacrifice in love for their fellow man. Our sincerest condolences go out to his family and members of the Memphis (TX) Fire Department. It is in great sadness that we as a Brotherhood post the 12th Line Of Duty Death in 2012 from the United States Fire Administration. Fellow Brother Firefighter/EMT Jeremy Tighe has made the ultimate sacrifice in love for their fellow man. Our sincerest condolences go out to his family and members of the McCutchanville Fire Department. Does your engine have a reserve or secondary line? This line is not a main per-connect, "the second line" or the back up. This line functions as a reserve set up. 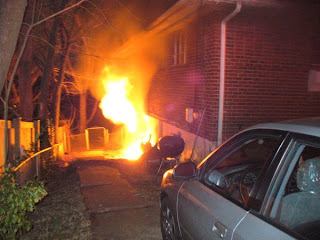 What would your FD do for this attached garage fire? What would you do to address the extension issues? Give us the report and your RECEO VS considerations. Enjoy! I am not sure if this cartoon is whimsical or prophetic, but it's a fact that we are all doing more with much, much less these days. Better limber up your toes, folks - they're going to be needed! Why do we work until our bell goes off? Why do you as a officer allow your crew to work until their bell goes off? Check your Dance Card Part 2: "getting closer"
Today I ask that you not only read but watch the below video and truly consider what I am recommending. storage and delivery system called a Trombe wall. It is in great sadness that we as a Brotherhood post the 11th Line Of Duty Death in 2012 from the United States Fire Administration. Fellow Brother Firefighter Zachary Whitacre has made the ultimate sacrifice in love for their fellow man. Our sincerest condolences go out to his family and members of the Gore Volunteer Fire& Rescue.